CardMaker, as the name suggests, is a free card making software that lets you create cards by customizing them according to your preference. Card Maker Software for Windows 8 includes single page cards like, thank you cards, post cards, invitation cards and much more. The application allows you to choose from among the various available options such as choosing text alignment, selecting own picture for the background of the card, choosing beautiful colors and amazing fonts for the text, choosing from among the various available borders. This application presents you with two screens namely the work board and the draft view. Most of the editing is done on the work board. Card maker shows the structure of the card in the draft view screen. As you complete the work, you can preview it and later on save it into a picture file on your disk. You just need to click on the checkbox in order to select. Shows the preview of the card created. Allows to choose you own back ground image. Allows to set the font size and page alignment. It allows to choose multicolor for the fonts. Go onto the given here. Unzip CardMaker2012.zip to any folder of your choice on your PC. From the card maker folder, you need to just run the setup. 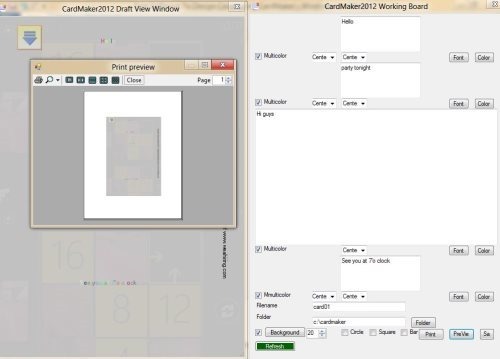 CardMaker is an efficient tool to create your own structure and creation cards according to your choice. Try it grab cards according your desired formats.